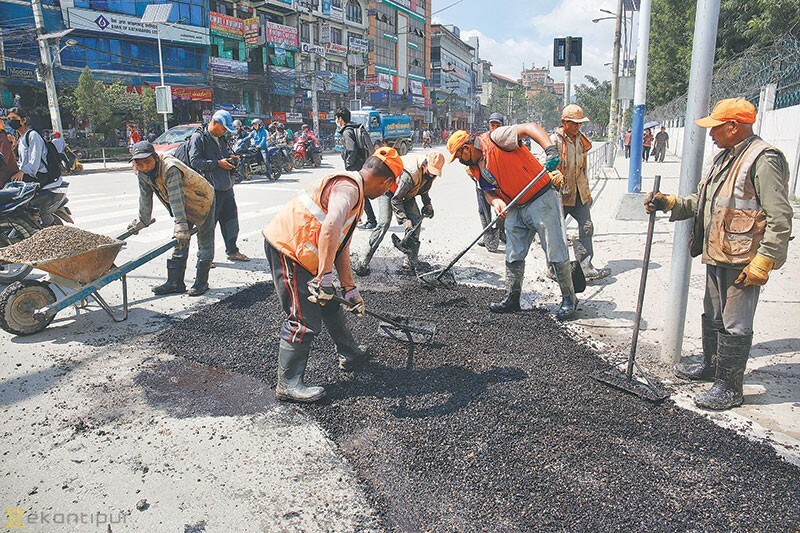 Nepal should consider hosting many international events because the authorities give city roads a makeover to impress foreign delegates and unwittingly alleviate citizens’ daily commuting woes. This charade happens ahead of important State visits and events. Roads in Kathmandu and Janakpur received facelifts to welcome Indian Prime Minister Narendra Modi earlier this year on May 11 and 12. It was done ahead of the 18th SAARC Summit held in November 2014. This act has begun again in Kathmandu ahead of the 4th Bay of Bengal Initiative for Multi-Sectoral Technical and Economic Co-operation (BIMSTEC) Summit. The event assembles top leaders from seven member states of South Asian and South East Asian countries in Kathmandu on August 30-31. A lot is at stake for Nepal, more than just good image. It is the current chair of the regional institution. Small wonder, there is a frenetic rush to patch giant potholes that punctuate Kathmandu roads. Torrential rains over the last fortnight have ruined the roads further. The Department of Roads (DoR) has initiated maintenance task by setting priorities based on the road sections. It has set August 28 as the deadline to complete the task. The Airport, New Baneshwor, Thapa Thali, Teku and Soaltee Mode roads have top priority as head of states and governments from India, Bangladesh, Bhutan, Myanmar, Sri Lanka and Thailand are likely to be guests of Hotel Soaltee Crowne Plaza. Tripureshwar - Maharajgunj, Shinamangal - Ratnapark, Ring Road and roads leading to Kathmandu, Lalitpur and Bhaktapur Durbar Square among others are on the maintenance list. The Ministry of Physical Infrastructure and Transport will oversee the progress of repairs. The ministry has informed other ministries responsible for drainage and electrification to make the necessary arrangements in the view of upcoming summit. DoR Spokesperson Mukti Gautam said the ongoing activities are part of the department’s regular job. He admitted road repairs have intensified as the country’s capital city is set to host a major event within a couple of weeks. On the durability of repairs carried out amid torrential rains, Gautam said crews have used bitumen emulsion on roads and reassured there will not be any issues in the days to come. “Such kind of bitumen comprises chemicals that ensure fixed patches and potholes remain intact even if it is fixed during slight rainfall,” Gautam said. He cited the success of this technology used on Jiri roads. An official at the Physical Infrastructure Ministry told the Post that lack of coordination between government agencies has delayed routine maintenance work. Frequent construction work and the tendency of leaving them unrepaired and incomplete for a long add to the woes of harassed city commuters. Following many complaints, Prime Minister KP Sharma Oli summoned Home Minister Ram Bahadur Thapa, Minister for Urban Development Mohammad Istiyak Rai, Minister of Water Supply Bina Magar, Minister for Communications and Information Technology Gokul Baskota and Minister Mahaseth last week and directed them to improve the infrastructure in Kathmandu Valley.